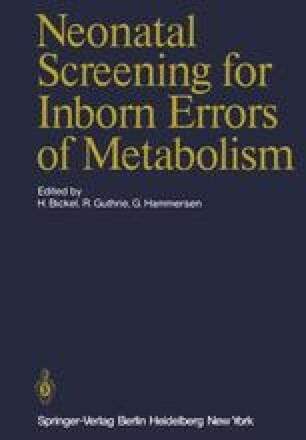 Routine urine screening of newborns for metabolic disorders is one of the most important of our many legacies from the late Dr. Mary Efron. It was she who first recognized the value of such screening in the early detection and in the understanding of those inborn metabolic and transport errors that are not identifiable by screening blood. It was she who first recognized that newborn screening could be easily performed using a filter paper specimen of urine that is as simple to collect and send to a central laboratory as the Guthrie blood specimen. And it was she who in 1966 initiated urine screening in Massachusetts. Supported in part by Health Services and Mental Health Administration (United States Public Health Service) grant 01-H-000111-08 and National Institutes of Health grant NS 05096.